The HWBOT World Tour 2017 continues with a fourth stop at Computex 2017 in Taipei, Taiwan. This is also the fourth year in a row that the overclocking event lands in the center of the PC hardware industry, starting with the HWBOT Anniversary Gathering in 2014. This year’s event will feature more activities than ever to celebrate overclocking! Building on the success of last year’s event, we are hoping to make this year’s event even bigger. Attendees will be able to gain hands-on experience with an extreme cooled system. They will also be able to bear witness to one of the most fiercely contested World Championship Qualification contests as six Overclockers from around the world compete in the G.SKILL OC World Cup for a place in the Overclocking World Championship Final. This one will be unmissable! At the heart of the HWBOT World Tour is the opportunity to help the global overclocking community come together. From May 26th to 28th, the HWBOT will host an Overclockers Gathering at the Taiwan World Trade Center in Central Taipei. Overclockers who are registered for the event will be able to enjoy access to unlimited LN2 and the company of others with a thirst for extreme, sub-zero overclocking. HWBOT will be able to provide access to a limited amount of hardware including Intel Core i7 7700K and Intel Core i7 6950X processors. Details regarding availability of motherboards, power supplies, monitors, keyboards will follow at a later date. Valued media partners are invited to learn the basics of Extreme Overclocking with expert tuition from experienced elite overclockers. Each workshop session offers around 20-30 mins of cooling with liquid nitrogen to push the latest unlocked Intel ‘Kaby Lake’ architecture processors to its limits. There are only few slots available per day so make sure to sign up soon for this memorable experience. G.SKILL return to Computex for their annual OC World Cup contest, an extreme overclocking contest where $10,000 USD in cash prizes is at stake. As an added incentive, the winner of the 2017 World Cup will also be crowned OCWC Champion – Taipei 2017, winning a ticket to the Overclocking World Championship Final at the end of the year. The G.SKILL World Cup 2017 will be held at the G.SKILL booth from May 30th to June 2nd and will be the pinnacle of competitive extreme overclocking at Computex 2017. For the sixth year running G.SKILL will host the OC World Record Stage. 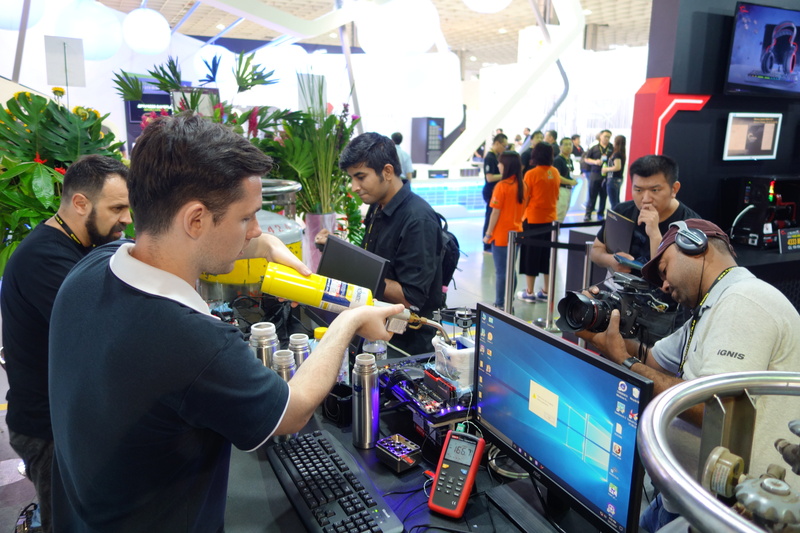 On each day of Computex 2017 a different team of Elite overclockers representing the world’s leading motherboard vendors will be invited to the G.SKILL booth for some seriously extreme overclocking. Overclocking talent from ASRock, ASUS, EVGA, GIGABYTE, and MSI will attempt to break as many World Records as possible. Note: this is a preliminary schedule – subject to change. Some activities may require you to have a Computex registration badge to gain entry.